My mom gave me a persimmon. She told me to eat it as soon as possible–she always tells me to eat my fruits as soon as possible; to her, fruits are always on the brink of self-destruction–but, my habit of procrastination extends even to my eating (assuming we’re not talking about something like the chocolate cake I just snarfed down). Fast forward a couple of weeks, and I decided I might want to eat this fruit before it got too much softer. But I couldn’t just eat it, of course, I had to make it into a project. I dug out a recipe I have for persimmon pudding with rum butter. My mom also gave me some bread. Bread goes much faster in my house than fruit does, probably because I can put butter on it. Yesterday, I ate the last sandwich roll. Suddenly, we were out of bread. So I got out the bread machine. Then I looked at the persimmon, and then I brought out the bread machine cookbook. 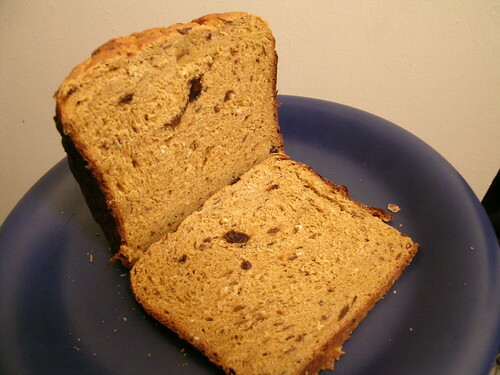 No persimmon bread recipes there, but I did find one for sweet potato bread. I looked back and forth between the pudding and bread recipes and turned thoughts over in my mind–thoughts like: is a bundt pan a fitting replacement for a pudding mold?–and then I decided on a compromise. If I’d had more than one persimmon, I could’ve made straight-up persimmon bread. But… the recipe called for 3/4 cup of some kind of mash and the persimmon only added up to 1/4 or 1/3 cup. So I added some sweet potatoes into the mix (two of ’em, microwaved and mashed) to fill in the gap. And so we have Persimmon Bread, Kinda. Note: I used 1/2 cup of plain yogurt thinned with 1/4 cup of water, since I didn’t have powdered milk. This entry was posted in baking, yeast bread and tagged persimmon, sweet potato. Bookmark the permalink.